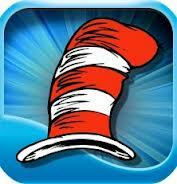 Children love the books of Dr. Seuss and now they can enjoy his fun rhymes electronically. Many of the fine works by Dr. Seuss are available for the iPad, but there are also other fun apps for kids. Transform your iPad into a musical instrument for children of all ages to enjoy. 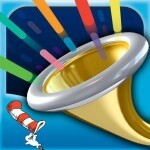 Dr. Seuss Band allows your child to listen to one of the app’s 10 original songs, including the soundtrack from The Cat in the Hat, Green Eggs and Ham, Dr. Seuss ABC, Hop on Pop, and more. Your little Mozart can also play their own music using the sounds of a trumpet, french horn, clarinet, trombone, and flute. All of the instruments also have “Seussian versions”. The app also features sound effects, such as fish bowl, train whistle, reverb, and more. Mix and match horn sounds for over 120 horn combinations. There is also three levels of play and your child can achieve a high schore to unlock more songs, horns, and effects. $0.99. This app is the original game for the movie “Dr. 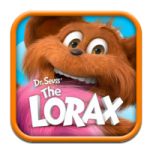 Seuss’ The Lorax”. 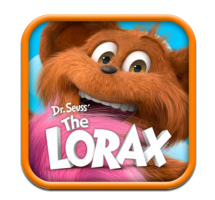 Your child will need to help the Lorax find colorful clusters of three or more matching objects to earn points. If they get stuck, they can shake the device to “Shuffula”. The game has a faced-pace button to challenge the player. Share your child’s scores and invite players on Facebook and Twitter. The app also includes the trailer for the movie. Free. Bring out the budding artist in your child with this app. Kids can color pages and create magical special effects with some of Dr. Seuss’ favorite charters. 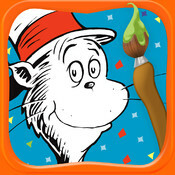 The included coloring packs feature The Cat in the Hat, Sally, Nick, Fish, and other animals. This app also features a confetti canon, animated graphics, crayons, chalk, paint, tap to fill, stickers, and patterns. Two coloring packs with 16 pages come in the app, but you can purchase more. There is also a sharing tool to share your child’s creation with family and friends. $3.99. Each of these apps features a collection of popular Dr. Seuss books with professional narration, background audio, and beautiful artwork for each scene. The books can either be read to your child, they can read it themselves, or it can be auto-played. When words are read aloud or tapped, they will be highlighted, which will help your child’s literacy skills. Collection #1 includes The Cat in the Hat, One Fish Two Fish Red Fish Blue Fish, The FOOT Book, Mr. Brown Can Moo, and Fox in Socks. Collection #2 includes Green Eggs and Ham, The Cat in the Hat Comes Back, There’s A Wocket in My Pocket, and Hop on Pop. #14.99 each. Organize all of your child’s Dr. Seuss book apps on the iPad with the Dr. Seuss Bookshelf. The app also includes a Store to purchase new books. The search feature allows you to browse the new books and sort them by price and age. Find all of the new releases and take advantage of introductory prices. And you will be the first to know when books go on sale or are offered for free. 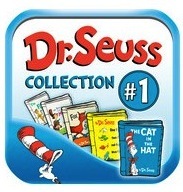 Dr. Seuss books that are their also apps include The Lorax, Green Eggs and Ham, Gertrude McFuzz, How the Grinch Stole Christmas, Oh The Places You’ll Go, Hop on Pop, Horton Hears a Who, and more. Free.